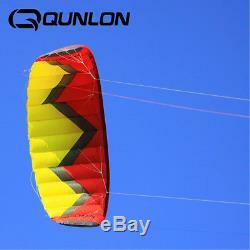 Safe and easy-to-launch 4-line traction kite designed for all the ages (10+ under supervision) and levels. 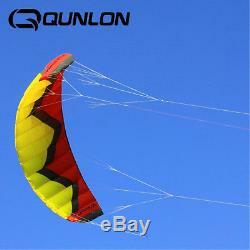 Great Training Kite for any one who want to feel the control of wind. 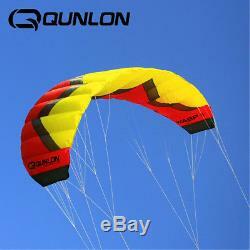 Perfect kite with leading edge design and exciting sport for a day out with friends and family. Easy to set up and launch! WASP is especially suitable for the beginners to practice basic traction control. No matter age and level, anyone who likes outdoor sports and want to enjoy the power and traction of wind, WASP will be the perfect choice that you start with. Is made of Ripstop Nylon fabric 40D both top and bottom skin which makes the light weight possible and provides great durability to confront gusty and irregular wind. Is hold all by Dyneema bridles. Compared to knots, sewn bridle loops with zig-zag stitch, provides cleaner looking, and is less likely to snag on another line. 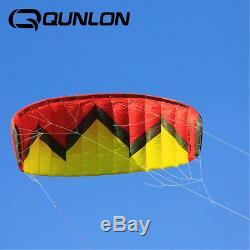 The leading edge is covered by meshcp constant air inlets and the foil shape of the kite, good design for flying in the lightest breeze and stable and easy piloting. Dimension: 410cmx138cm / 13.45x4.53ft. Weight: 930g / 1.65lb. Wind range: 25 bft / 424MPH. 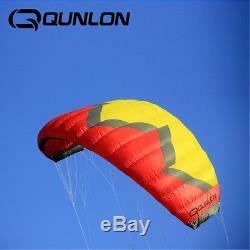 Package Include: Kite Only (Flying Tools & Tools Not Included). Our customer service will reply in 24hours. The item "5m² Quad Line Traction Kite Powerkites Trainer Kite Land Boarding Kite Surfing" is in sale since Monday, January 26, 2015. 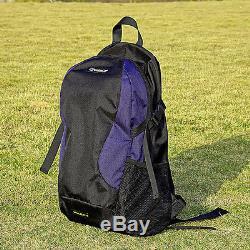 This item is in the category "Sporting Goods\Water Sports\Kitesurfing\Kites, Lines".zhang" and is located in Beijing.